Safety Sector's 4 bar anti-slip stair nosing for stairs is manufactured with high quality non-corrosive anodised silver frame. Compliant with AS1428.1, both safety and durability is achieved with our anti slip stair nosing. The supplied length is 3600mm or 3.6m standard with countersunk holes for installation. Other pre-cut length are also available upon request. Aluminium stair treads with anti slip black carborundum inserts can be installed easily using screw or glue to a variety of fixings and surfaces such as concrete, timber, tiles and carpets. Anti-slip stair nosing or stair treads are also widely used in both indoor and outdoor settings for extra safety and protection.There are a variety of stair treads to choose from, the standard anti-slip rubber stair-nosing , black or yellow fiberglass stair nosings as well as black carborundum anti-slip nosing for stairs. 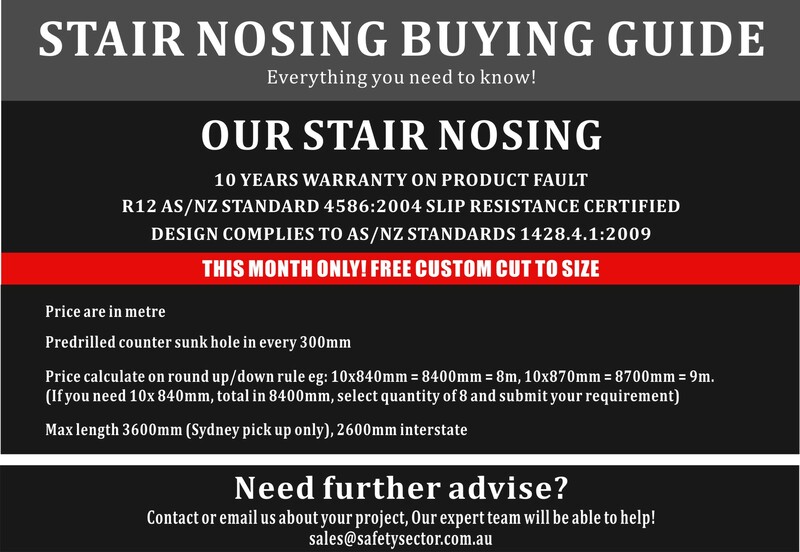 Stair nosing treads are surely an essential architectural safety equipment for your stairs both indoors and outdoors offering safeguard against slip and related accidents.